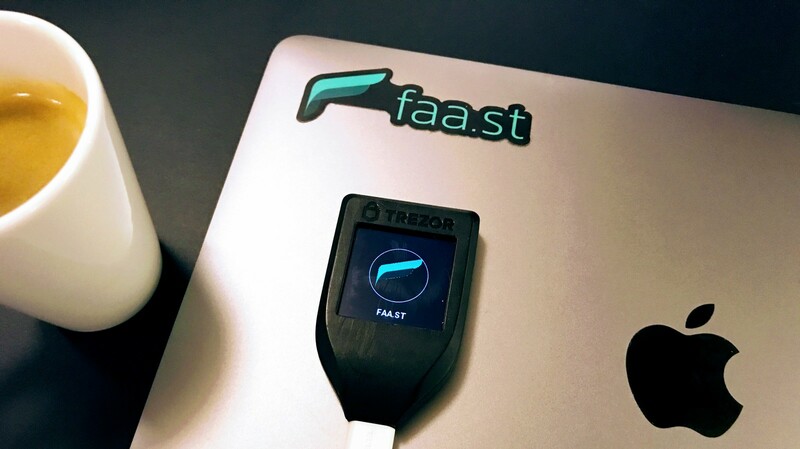 Last year we published a guide covering how to use a Trezor One wallet with Faast, and it has proven to be one of our most popular articles to date. In 2018, SatoshiLabs also released the Trezor Model T, a new product which has raised the bar for what a hardware wallet can be. Today we’re going to show you how to use a Trezor Model T, and why it’s a perfect match for Faast’s instant crypto swapping and portfolio management features. The Model T differs from the older Trezor One wallet in several important ways. The most obvious is the touchscreen design. From an ease of use standpoint, this gives it an edge over the Trezor One. The Model T also supports a wider variety of cryptocurrencies (over 700 at this time). If you want to build a diversified portfolio with many different altcoins, the Model T might be a better option. The first thing you should do when you purchase a Model T is ensure that it has not been tampered with. Last year, stories began circulating about Trezor wallets (including Model Ts) which had tamper seals that had been moved or altered, as well as fake knock-off wallets being sold online. These wallets pose a security risk and could result in your holdings being stolen. The easiest way to avoid this is to buy your Trezor Model T directly from the manufacturer’s website. After you have made sure your Model T is real, you need to set it up properly. Here’s a great guide that will help you get started. 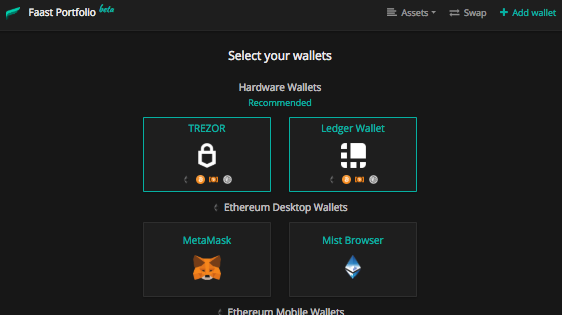 On the next screen, select the “TREZOR” icon. Click “add all currencies” in the window that pops up to ensure that all assets you have on your wallet will be visible in your portfolio. 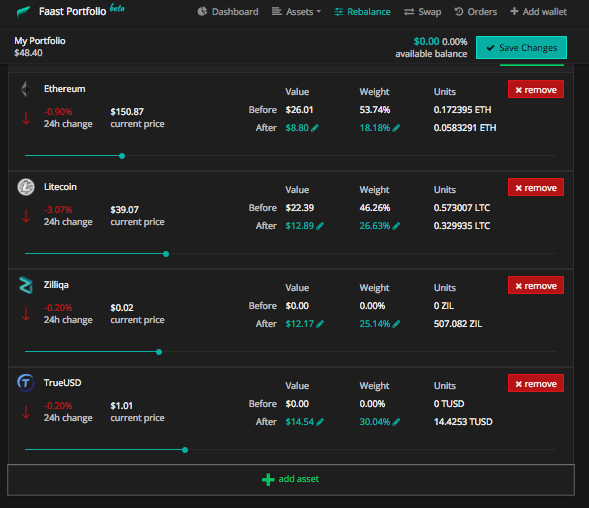 Once you’ve finished connecting, you’ll see the familiar Faast portfolio screen, breaking down your holdings by percentage, weight, dollar amount, etc. 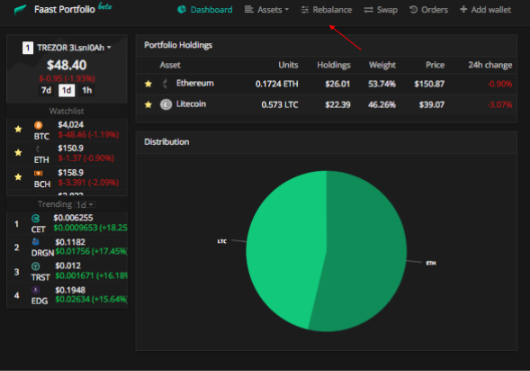 To swap assets in your portfolio, just click the “Rebalance” link and you’ll be taken to the Faast Rebalancing tool, which features a simple, slider bar interface that allows you to add and remove assets from your Trezor Model T with ease (you can also just type in the exact amounts). Click “Save Changes to initiate the swaps. Confirm the transactions on your Trezor Model T touchscreen. Faast doesn’t just save you money, it can save you a lot of time as well. One cool thing about Faast is that it allows you to simultaneously add and remove multiple cryptocurrencies from your Trezor Model T at once. 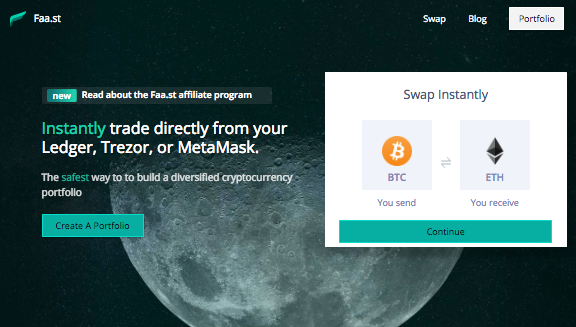 Combine the Trezor Model T with Faast, and you have the two most powerful tools available to the public for building an amazing cryptocurrency portfolio and managing it like a pro. Visit https://faa.st/ now to get started.